Germany: Carl Schmitt, Professor of Law at Berlin University, joins the National Socialist Party. His influence will draw many German academics and lawyers to accept the new order. Germany: The NSDAP organization, unable to handle the 850,000 new requests for membership, calls a moratorium on recruitment until May 1937, except for those already in other affiliated organizations (SA, SS, Hitler Youth, etc). CBI - China: Day 121 of 142 of the 1st Battle of Hebei. Germany: During this month, SS leader Theodor Eicke is given the task to reorganize all concentration camps, using the Dachau Concentration Camp as a model. USA: A mistake by the US Government Printing Office, which leaked War Plan Red (preparation of war against the UK and Canada), is published on the front page of the New York Times. War Plan Red will be officially terminated in 1939. Germany: The NSDAP introduces ambitious new plans for controlling the population. This includes dividing the population into blocks of 40 to 60 households under local chiefs (not necessarily a party member) responsible for the political outlook, education and morale of every inhabitant, member or not. Germany: Adolf Hitler declares that all German children are to be raised as loyal Nazi Germans. France: The Polish Military Attaché in Paris agrees to cooperate with the Belgian General Staff in exchanging information concerning activities of the German Army. Spain: Day 289 of 985 of the Spanish Civil War. Spain: Day 654 of 985 of the Spanish Civil War. Spanish leader Dr Negrin tries to sue for peace but General Franco demands nothing less than unconditional surrender in the Spanish Civil War. CBI - China: Day 299 of 2,987 of the 2nd Sino-Japanese War. Day 84 of 124 of the Battle of Henan. Day 39 of 39 of the Battle of Xuzhou. Japanese troops capture the city of Xuzhou. 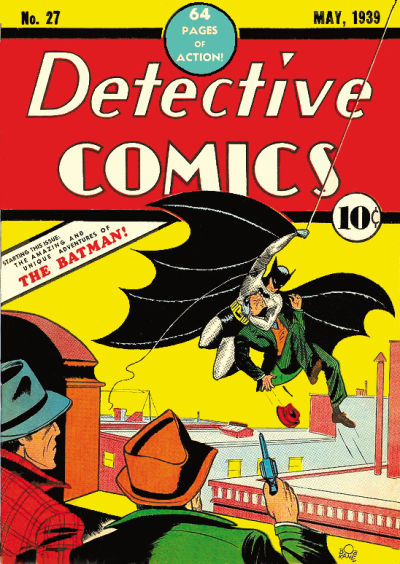 USA: Batman, created by Bob Kane, makes his debut appearance in Detective Comics #27. DC Comics avoided any specific mention of the emerging Axis powers until after the 01 Mar 41 release of the intentionally patriotic Axis-fighting comic book hero Captain America. But while other superheroes (and a whole bunch of new ones) then got busy punching Hitler every other day, Batman never did. 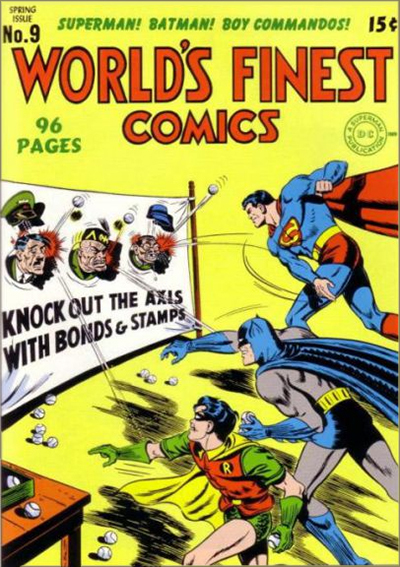 In one comic book, Nazi saboteurs came to Gotham City and Batman did take them down, but Batman's only confrontation with Adolf Hitler himself happened on the cover of World's Finest #9 where Batman, Robin and Superman throw baseballs at Der Fuhrer, Il Duche and Tojo. Many DC Comics covers used their superheroes to promote the sale of war bonds. CBI - China: Day 664 of 2,987 of the 2nd Sino-Japanese War. Day 46 of 54 of the Battle of Nanchang. Day 12 of 35 of the Battle of Suizao. USA: President Roosevelt urges Italy to stay out of the European War. Mussolini's response indicates that Germany cannot be defeated. UK: The British government passes a trade union agreement with the Amalgamated Engineering Union which allows women to work in munitions factories. Atlantic: In the Kattegat, British submarine HMS NARWHAL attacks a German merchant convoy sinking the German steamer BUENOS AIRES and damaging the BAHIA CASTILLO. ETO - Norway: Day 23 of 63 of the Battle of Norway. The Norwegian troops at Lillehammer surrender. King Haakon VII sets up a provisional government at Tromsø. A Royal Navy task force arrives at Åndalsnes to begin evacuating Allied troops. ETO - UK: In England, A German mine-carrying bomber crashes at Clacton, Essex, killing the two-man crew, two civilians, and wounding another 156 people. ETO - France: Swiss intelligence learn the Germans will soon be invading on France and informs the French. 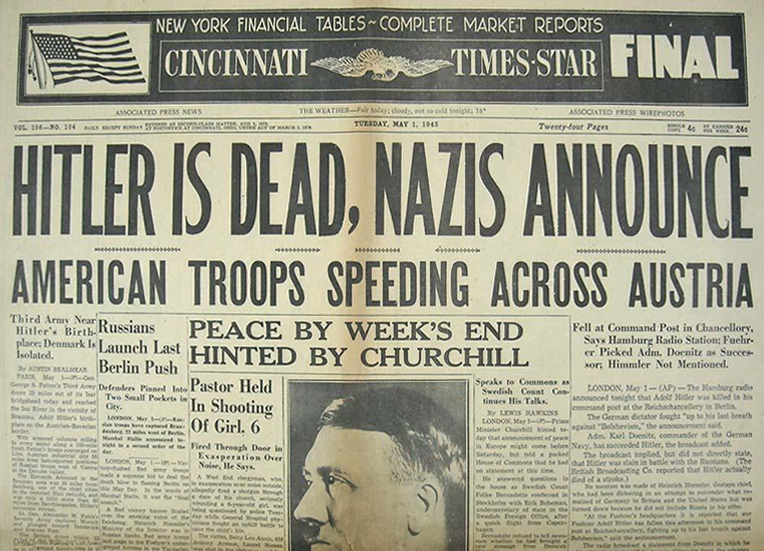 Meanwhile in Germany, Hitler pushes the invasion date to 5 May 1940. Germany: Rudolf Höss is appointed the first Commandant (kommandant) of Auschwitz Concentration Camp. CBI - China: Day 1,030 of 2,987 of the 2nd Sino-Japanese War. Day 169 of 381 of the Battle of South Guangxi. Day 1 of 49 of the Battle of Yichang. Japanese troops march on Yichang in the Hubei Province. USA: The breakfast cereal Cheerios is introduced as CheeriOats by General Mills. Atlantic: German sub U-552 sinks the British passenger liner NERISSA 100 miles north of Ireland. 207 are killed, 83 survive. German sub U-103 sinks the British ship SAMSO 200 miles off Sierra Leone, British West Africa. Atlantic: The British ocean boarding vessel HMS CAVINA captures Italian tanker SANGRO 400 miles north of the Azores islands. ETO - UK: Day 238 of 258 of the Blitz. The Luftwaffe begins a series of 8 consecutive night raids on Liverpool. Germany: Groß-Rosen Concentration Camp, formerly a satellite camp of the Sachsenhausen Concentration Camp, becomes an independent camp, located in Groß-Rosen, Lower Silesia, Germany (now Rogoznica, Poland). MTO - Libya: Day 22 of 256 of the Siege of Tobruk. The German morning attack on Tobruk is repulsed. In the evening the Australians counter-attack but no ground is taken. MTO - Tunisia: British sub HMS UPHOLDER sinks the freighters ARCTURUS and LEVERKUSEN off Kerkenah Island. The HMS JERSEY hits a mine in Valeta, Malta, and later sinks during a German air raid. Middle East: The Iraqi forces overlooking the RAF at Habbaniya grows to 9,000 men. They demand the RAF ceases all flight operations but the threat is ignored. East Africa: Day 326 of 537 of Italy's East African campaign in the lands south of Egypt. The Viceroy of Italian East Africa, Duke of Aosta, and 7,000 troops are trapped at Amba Alagi, Abyssinia, by the Indian 5th Indivision in the north and the South African 1st Brigade in the south. CBI - China: Day 1,395 of 2,987 of the 2nd Sino-Japanese War. CBI - Thailand: Day 213 of 221 of the Franco-Thai War (Vichy France vs Thailand). 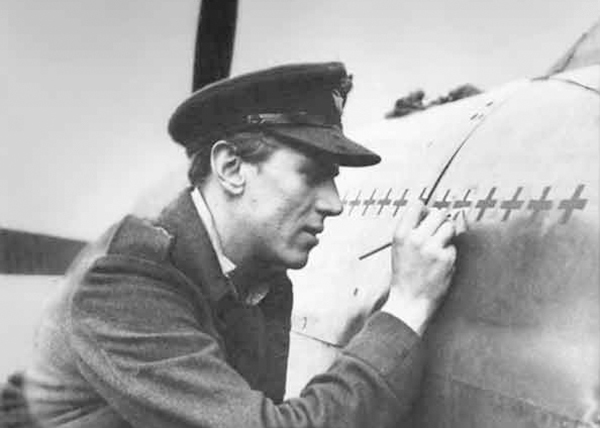 ETO - France: RAF fighter pilot George Beurling gets his first of 31 kills in a sweep over Calais. Beurling, a Canadian, will go on to become Canada's most famous hero of WWII, distinguishing himself in the defense of Malta. Beurling, nicknamed the "Falcon of Malta" and the "Knight of Malta," can best be described as having possessed superhuman abilities. He had a computer-like mind for mathematics and detail unlike any other. His record includes shooting down 27 enemy planes in 14 days and scoring one kill from a distance of 800 yards. Atlantic: Day 108 of 169 of Germany's Second "Happy Time," during which U-boats sink 609 Allied ships with little risk. Atlantic: The HMS KING GEORGE V, in a thick Atlantic fog, accidentally rams and sinks the HMS PUNJABI. ETO - UK: The plan to construct an oil pipeline under the English Channel between England and France (Operation PLUTO) is tested in the River Medway. Russian Front - North: Day 236 of 872 of the Siege of Leningrad. The fighting becomes more intense as the civilians are suffering from bombings, disease and starvation. Russian Front - North: Day 83 of 102 of the Battle of the Demyansk Pocket, another failed attempt to break the siege at Leningrad. Russian Front - North: Day 99 of 103 of the Battle of the Kholm Pocket. Another attempt to break the siege at Leningrad. Russian Front - South: Day 184 of 248 of the Siege of Sevastopol, Crimean Peninsula. The Germans step up their bombardment on the city flying up to 1,000 bombing sorties per day. CBI: The US 10th Air Force is activated under command of Brigadier General Elmer E Adler. CBI - Burma: Day 139 of 164 of Japan's Invasion of Burma. The Japanese capture Monywa and Mandalay. Further north, Japanese and Chinese troops clash at Hsenwi. CBI - China: Day 1,760 of 2,987 of the 2nd Sino-Japanese War. PTO: Changes to the Japanese code book, originally set to take place on this date, is delayed. This small delay will cost the Japanese dearly at the Battle of Midway. PTO - Malaya: Day 72 of 357 of the Battle of Timor Island. PTO - Philippines: Day 145 of 152 of the 1st Battle of the Philippines. ETO - France: US 8th Air Force B-17s bomb a U-boat base and shipyard at Sainte-Nazaire. The Medal of Honor will be awarded to gunner "Snuffy" Smith aboard one of the Flying Fortresses of the 306th Bomb Group for his heroic conduct during the mission. 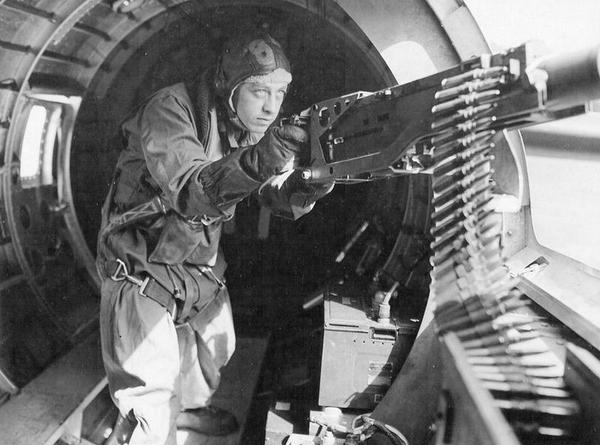 It was during his first mission, on 01 May 43, that Staff Sergeant Smith, who was assigned to the ball gun turret, helped save the lives of six of his wounded comrades, put out a blazing fire, and drove off wave after wave of German fighters. The target of the mission in occupied France was heavily defended by antiaircraft guns and was nicknamed "flak city" by the airmen. The bombers dropped their payload on target with little resistance from the Germans, but then the Luftwaffe fighters came up in pursuit. The Group managed to elude them by flying into a large cloud bank. Due to a navigational error, after being in the cloud bank, the navigator in the lead plane believed he was approaching the southern coast of Britain. In fact, the aircraft were approaching the heavily fortified German-occupied French city of Brest and the southern coast of the Breton Peninsula. The pilot began to descend to 2,000 feet and was almost immediately overtaken by several German fighters and thick anti-aircraft fire. Smith's bomber was hit, rupturing the fuel tanks and igniting a massive fire in the center of the fuselage. The damage to the aircraft was severe, knocking out communications and compromising the fuselage's integrity. Smith's ball turret lost power and he scrambled out to assist the other crew members. Three crew members bailed out, while Smith tended to two others who were seriously wounded. In between helping his wounded comrades, Smith also manned the .50 caliber machine guns and fought the raging fire. The heat from the fire was so intense that it had begun to melt the metal in the fuselage, threatening to break the plane in half. For nearly 90 minutes, Smith alternated between shooting at the attacking fighters, tending to his wounded crew members and fighting the fire. To starve the fire of fuel, he threw burning debris and exploding ammunition through the large holes that had been melted in the fuselage. After the fire extinguishers were exhausted, he finally managed to put the fire out, in part by urinating on it. Sgt Smith's bomber reached England and landed at the first available airfield, where it broke in half as it touched down. Smith's bomber had been hit with over 3,500 bullets and shrapnel. While the three crew members that bailed out were never recovered and presumed lost at sea, Smith's efforts on that day undoubtedly saved the lives of six others aboard his aircraft. Smith was assigned to KP duty the week that he was awarded the Medal of Honor as punishment for arriving late to a briefing. 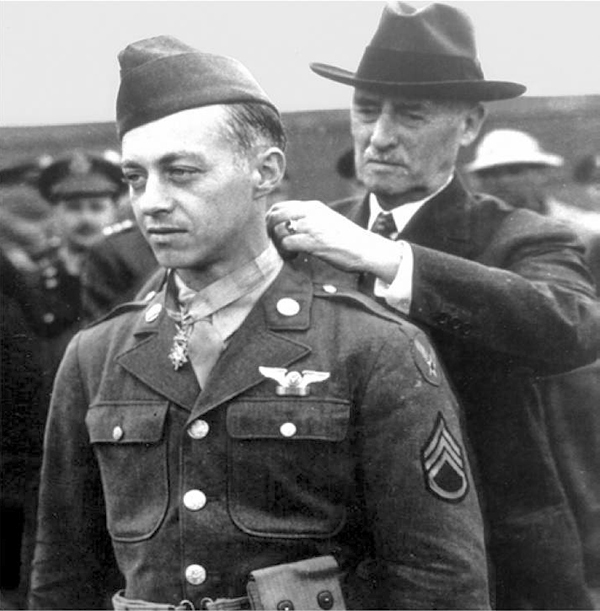 Secretary of War Henry L Stimson placed the Medal around Smith's neck during a formation. ETO - France: US 8th Air Force B-24 Liberators attack targets along the Brittany Coast. Russian Front: The German-convened International Medical Commission, along with the Red Cross and Allied POW officers, completes its investigation on the Katyn Massacre, concluding that the Soviet Union is responsible for the atrocity in which over 20,000 Polish police, military officers and intellectuals are murdered and buried in mass graves. Russian Front - North: Day 601 of 872 of the Siege of Leningrad. Russian Front - North: Day 362 of 658 of the Siege of the Kholm Pocket. MTO - Tunisia: Day 166 of 178 of the Battle of Tunisia. RAF and US Air Forces provide Allied air support. Day 5 of 5 of the Battle of Hill 609. The US troops capture the hill. MTO - Italy: US 9th Air Force B-24s bomb the harbor at Reggio di Calibre. CBI - China: Day 2,125 of 2,987 of the 2nd Sino-Japanese War. PTO - Alaska: Day 329 of 435 of the Battle of Kiska, Aleutian Islands. US 11th Air Force attacks targets on Kiska and Attu sixteen times during the day. PTO - Japan: The USS FLYING FISH sinks a Japanese freighter and survives a heavy depth charge during the counter-attack. PTO - New Guinea: Day 10 of 148 of the 2nd Battle of Lae-Salamaua. 5th Air Force provides air support. UK: The first British Commonwealth Prime Ministers' Conference begins in London and will last until the 16th. They will agree to support the Moscow Declaration and reach an agreement regarding their respective roles in the overall Allied war effort. ETO - France: British Squadron Leader Maurice Southgate, the coordinator for the various Marquis groups between the Loire River and the Pyrenees mountains, is arrested by the Gestapo in Paris. ETO - France: US 8th Air Force In the morning, B-17s and B-24s bomb V-weapon bases and airfields in France. During the afternoon, they hit targets in Belgium and northern France. ETO - France: US 9th Air Force B-26s and A-20s attack numerous marshalling yards and industrial targets in France and Belgium. Russian Front: The Organizational Division of the German Prisoner of War Office reports that a total of 5,165,381 Soviet prisoners are in German captivity. Russian Front - North: Day 90 of 191 of the Battle of the Narva Isthmus, Estonia. Both German and Soviet troops remain in their defensive positions. Russian Front - South: Day 24 of 35 of the Battle of the Crimea. Russian Front - South: Day 24 of 60 of the Battle of Romania, 1st Jassy Offensive. MTO - Yugoslavia: The Yugoslavian partisan leader Josef Tito announces he has a force of 60,000 men and is officially recognized by the Allies. MTO - Italy: Day 106 of 123 of the Battle of Monte Cassino. RAF and US Air Forces provide air support. The German Gustav Line continues getting weaker. MTO - Italy: Day 101 of 136 of the Battle of Anzio. RAF and US Air Forces provide air support. CBI - Burma: Day 58 of 166 of the UK's Operation THURSDAY. CBI - Burma: Day 53 of 147 of the Battle of Myitkyina. US 10th Air Force provides air support. CBI - Burma: Day 31 of 302 of the Chinese Salween Offensive. US 14th Air Force provides air support. CBI - China: Day 2,491 of 2,987 of the 2nd Sino-Japanese War. Day 15 of 259 of Japan's Operation ICHI-GO. Day 15 of 39 of the Battle of Central Henan, the first offensive in Japan's Operation ICHI-GO. Chinese continue retreating from central China. CBI - India: Day 55 of 118 of the Battle of Imphal-Kohima. Anglo-Indian troops attack Crete West hill just outside of Imphal. PTO - Caroline Islands: The US Navy completes a two-day raid on Truk, which destroyed 120 Japanese aircraft. PTO - Marshall Islands: The US 7th Air Force bombs Jaluit Atoll. PTO - New Guinea: Day 63 of 80 of the Battle of the Admiralty Islands. 5th Air Force provides air support. PTO - New Guinea: Day 139 of 597 of the Battle of New Britain. US 13th Air Force provides air support. PTO - New Guinea: Day 10 of 481 of the Battle of Western New Guinea. PTO - Solomon Islands: Day 183 of 295 of the Battle of the Bougainville Islands. US 13th Air Force provides air support. 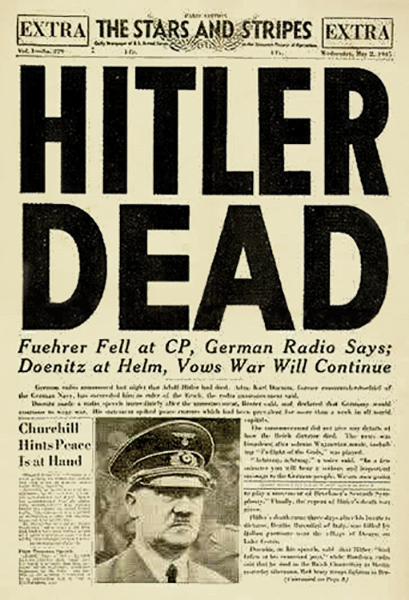 Germany: One day after Adolf Hitler committed suicide, Hamburg Radio interrupts its normal programming to announce that Hitler has died in battle, "fighting up to his last breath against Bolshevism." The Stars and Stripes newspaper began in 1861 during the American Civil War when Union soldiers set up camp in Bloomfield, Missouri, and found the local newspaper office empty. They decided to print a newspaper about their exploits, calling it the Stars and Stripes. Its publication during WWII kicked into high gear with editions for each theater of operation that regularly brought news and entertainment to millions of US soldiers. Grand Admiral Karl Dönitz, appointed as Hitler's successor in Hitler's will, called on the German people to mourn their Führer and stated that the war would continue in order to save Germany from destruction by the advancing Bolshevist enemy. He added that as long as achievement of that aim was impeded by the British and the Americans, Germany would be forced to carry on their defensive fight against them, as well. In the end, his tactic was somewhat successful, as it enabled about 1.8 million German soldiers to avoid Soviet capture, although it comes at a very high cost in bloodshed. This is yet another example of how dates and times can often differ by one day depending on various factors. 02 Jan 39: Time magazine names Adolf Hitler "Man of the Year"
Germany: Following the death of Hitler, Grand Admiral Dönitz takes command of all German forces. He orders the utmost resistance in the east where tens of thousands of German civilians are still trying to escape from the stampeding Soviet Army. ETO - Netherlands: US 8th Air Force B-17s drop food supplies for the civilians in Rotterdam and The Hague. ETO - France: Day 276 of 284 of the Battle of Brittany. ETO - France: Day 229 of 236 of the Siege of Dunkirk. ETO - Germany: US 9th and British 2nd Armies combine their bridgeheads across the Elbe River in northern Germany. US 3rd Army reaches the pre-war German-Austrian border at Braunan, 70 miles east of Munich. The Allies capture German Field Marshal Gerd von Rundstedt. ETO - Germany: German concentration camp authorities order the execution of former Chancellor of Austria Kurt Schuschnigg, who had been imprisoned since the German invasion of Austria in 1938 and is currently held in Dachau. But amid the chaos of the final days of the Reich, SS guards there abandon the prisoners into the hands of officers of the Wehrmacht, who then free all prisoners. After WWII, Schuschnigg will emigrate to the United States, where he will work as a professor of political science at Saint Louis University from 1948 to 1967. ETO - Czechoslovakia: US 9th Air Force A-26s bomb an ammunition plant at Stod. Russian Front - Center: Day 199 of 206 of the Battle of the Courland Pocket in Latvia. Russian Front - Center: Day 16 of 23 of the Battle of Settin-Rostock, both sides of the border between Germany and Poland. Day 9 of the 11-day Battle of Bautzen. Soviets and Germans engage in heavy fighting, but it's still debated as to who won the day. Russian Front - Center: Day 16 of 17 of the Battle of Berlin. The German 12th Army leaves Berlin to the Elbe River in hopes of beginning negotiations with the US. Russian Front - Center: Day 78 of 83 of the German Siege of Breslau (today Wroclaw, Poland). The 4th Ukrainian Front captures Moravska Ostrava. Russian Front - Center: Day 7 of 8 of the Battle of Halbe, Germany. MTO - Italy: Although unauthorized, German General von Vietinghoff announces the surrender of all German forces in Italy and calls for all hostilities to cease. The German troops in Italy do surrender in accordance with secret negotiations, followed by an announcement for the cessation of hostilities. MTO - Italy: Day 26 of 27 of Operation GRAPESHOT. New Zealand troops capture Udina and link up with the Yugoslavian partisans near Trieste. The Allied Air Forces provide air support. MTO - Italy: The US 15th Air Force conducts its final bombing mission in Italy. CBI: The USS HAWKBILL damages the Japanese minelayer HATSUTKA, which reacts by grounding itself to prevent sinking. CBI - Burma: Day 87 of 99 of the Battle of Pakokku and Irrawaddy River operations in central Burma. The British 14th Army captures Pegu. CBI - Burma: Day 7 of 12 of the Battle of Rangoon. US 10th Air Force provides air support. The UK wins the one-day Battle of Elephant Point, near Rangoon. Meanwhile, Indian paratroopers land just south of Rangoon to spearhead Operation DRACULA, the conquest of Rangoon. CBI - China: Day 2,856 of 2,987 of the 2nd Sino-Japanese War. Day 31 of 91 of the Battle of Zhijiang. US 14th Air Force provides air support. Day 23 of 60 of the Battle of West Hunan (near Zhijiang). Japanese troops begin to withdraw from southern China. PTO - Caroline Islands: US 7th Air Force hits air installations on Param Island, Truk Atoll. PTO - Dutch East Indies: Day 1 of 52 of the Battle of Tarakan Island. The Australian troops land on Tarakan Island. PTO - Formosa: US 5th Air Force bombs the Heito sugar refinery and the town of Kagi. PTO - Japan: Day 31 of 83 of the Battle of Okinawa. PTO - New Guinea: Day 491 of 597 of the Battle of New Britain. US 10th Air Force provides air support. PTO - New Guinea: Day 375 of 481 of the Battle of Western New Guinea. US 10th Air Force provides air support. PTO - Philippines: Day 194 of 299 of the 2nd Battle of the Philippines, aka the Liberation of the Philippines or the Philippines Campaign. PTO - Philippines: Day 138 of 244 of the Battle of Luzon. 5th Air Force provides air support. The Mexican Air Force 201st Squadron arrives at Manila. During the war, they will fly 96 combat missions. This is the only Mexican unit to see overseas combat in their nation's history. PTO - Philippines: Day 53 of 159 of the Battle of Mindanao Island. 5th Air Force provides air support. PTO - Philippines: Day 45 of 135 of the Battle of the Visayas region. US 5th and 7th Air Forces provide air support. 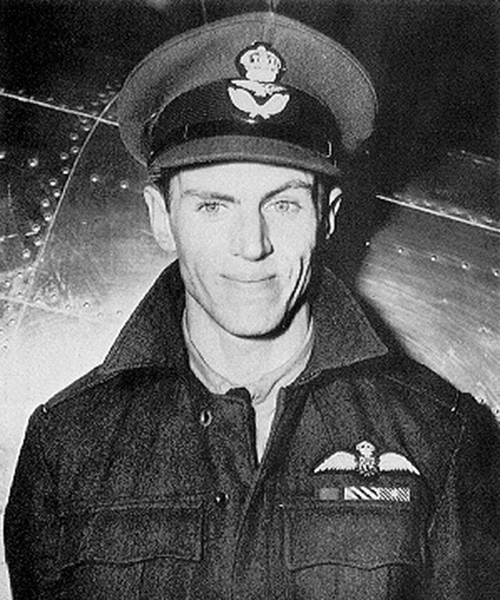 Canadian George Beurling truly had powers beyond those of mere mortals when he was in the cockpit of a Spitfire, going up against superior numbers of German and Italians fighters.